Step 1: What Are You Trying to Achieve? It seems like a simple enough question that should have a simple answer: “Well, I need a new bathroom.” But when embarking on a journey that will take a good chunk out of your time and bank account, you want to get it right. And you want to be happy with the end result. How many people will use it? How much time do you spend in the bathroom during the morning, afternoon and night? What’s your routine — how does your current space hinder it and how could a new space improve it? Do you plan to grow old in this house? Do you have medical issues like poor eyesight or arthritis to consider? Do you just want something that’s easy to clean? Is storage the catalyst? Relaxation? Or do you just want to update the look for resale? Would your dream bathroom include towel warmers, steam showers, fireplaces or TVs? All these things will help guide you in your decisions. Updating the look. If you’re happy with the layout of your current bathroom but feel it just needs a refresher, then you’ll be focusing your attention on material selection and perhaps new cabinetry or plumbing fixtures. Resale value. If you’re updating your bathroom to sell, you’ll want to look at what potential buyers might want. While it’s hard to anticipate what a random buyer is looking for, you can do a little research on what appeals to the majority of homeowners. Houzz’s trends studies are a good place to start, but also talk to designers, neighbors, friends and family about what’s best for your area. Better functionality and more storage. Perhaps you’ve always hated how the door swings open and hits the vanity, or you’re tired of stacking toilet paper on the toilet reservoir and seeing makeup on the counter. Maybe you never use the bathtub and long for a larger shower. Or wish for two sinks instead of one. Or crave more natural light. This level of remodel will likely have you gutting the space, and possibly rearranging the elements within it and rerouting plumbing. This would result in an all-new bathroom. This category would be on the higher end too. Before you get ahead of yourself, it’s best to know what you will be able to spend. You probably already have an idea of what you can afford, so the first thing you’ll want to understand is how much a bathroom remodel is going to cost. The median spend on master bathroom remodels in the U.S. is $7,000, according to a 2018 Houzz bathroom trends study. Consider whether you’re after a basic remodel ($3,000 to $12,000), a mid- to upper-range one ($12,000 to $35,000) or a deluxe remodel ($35,000 to $100,000 and up), and always factor in a cushion of at least 10 to 20 percent more for unforeseen costs that might arise. Remember: To keep costs down, see if you can make your updates without moving any of the existing plumbing or wiring. Whether or not to hire a professional for any part of your project is up to you. If you know what you want and where to find what you need, and are confident that your ideas will work, then the design phase could be left up to you. But know that a professional bathroom designer may be able to think of things you may not have considered — like fitting a washer and dryer into your bathroom, adding a skylight or rearranging the space in a creative way to maximize functionality and efficiency. There are different ways you can work with a designer. A little guidance from a design consultation or a more developed vision with a design plan may be all you need to get started. For particularly complicated jobs, full design services are probably best. If you’re comfortable tackling the demolition, construction and installation yourself, you may not need a general contractor. But it’s a project that can quickly get out of your grasp. If you lack experience, a bathroom remodel could take you several times as long as a professional to complete, and the result might still be of poor quality. The complexity of routing plumbing, laying tile and flooring, installing vanities and toilets, and more leaves way too much room for error, and you’re likely to mess something up, lose money and end up with a bathroom that’s full of flaws. If you want to cut down a little on your budget, stick to straightforward tasks like painting. For major structural changes, you may need to hire an architect. Plumbing and electrical work is almost always hired out. In some places, it’s required by law. When in doubt, hire a pro to help. Gather photos of bathrooms you like. You can create an ideabook on Houzz to store and organize photos of layouts, styles, finishes and more. For example, you may like how the toilet, vanity and shower are laid out in one particular photo, but don’t necessarily like the style, color or materials in that space. If your dream bathroom doesn’t seem as though it could ever fit in the space you have, think about what’s on the other side of the bathroom walls. Can you steal space from an adjacent closet, bedroom or other unused area? Is it possible to punch out from your home to create more room? Other options to consider are whether or not you want the toilet out in the open or in its own water closet. What kinds of special storage you need — for the hair dryer, makeup, shaving kit and more. How to get more natural light. Or even how to incorporate sinks and vanities to fit your height and that of your spouse or partner. Can you create a transition area that connects through a closet and dressing area and then out to the hallway, so you don’t have to wake your spouse or partner while getting ready in the morning? There’s almost no end to what you can dream up and execute, so think ahead and plan accordingly to get everything you want. And it may seem mundane, but something as simple as where the outlets will go can have a huge impact on your morning routine. Do you charge your phone in the bathroom? Use a hair dryer or other devices? Now is when you will want to make a plan for how you’ll access the power source. Other considerations may include things like where you should put the toilet or even where you will keep the toilet paper. Choosing the style of bathroom you want can be complicated. Designers recommend that you look to the rest of your house for a jumping-off point. 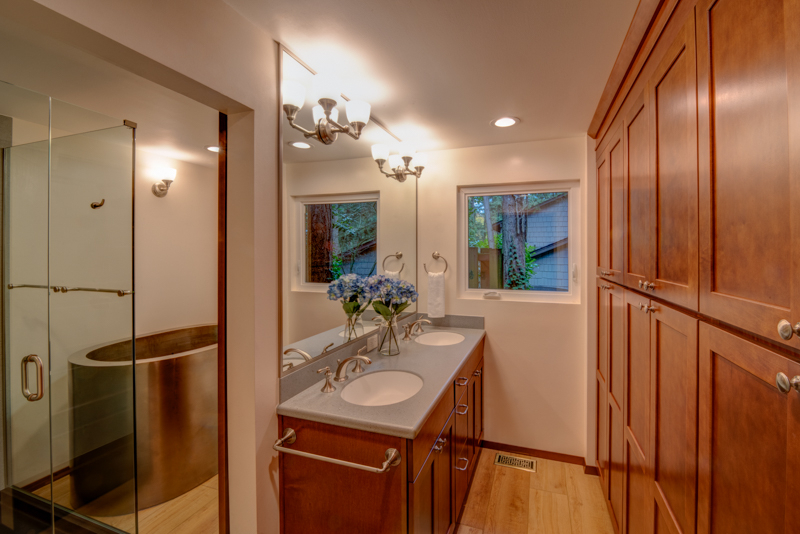 For example, you probably don’t want to do an industrial-style bathroom in a Craftsman home. But, hey, it’s your money. Again, look to photos that inspire you and gather as many ideas as possible, leaving nothing to chance. With so much going on during a remodel, it would be a shame to make a knee-jerk decision on a material or style that in the end you won’t be happy with because you didn’t make the time to plan for it. In this phase, you’ll be reviewing sketches and preliminary floor plans and elevations that show the layout of your planned bathroom and the size of its components, like the vanity and any cabinetry. The point here is to get the major elements and spacing down before moving forward, not to have a complete picture of how the finished bathroom will look in terms of color and materials. Once the measurements and sizes are nailed down, then you will know how many square feet of tile you’ll need to order or how big of a marble slab you’ll need for the countertop. You or your designer can use this info to start shopping around for prices on materials. These drawings, sketches and scope of work will be used to interview contractors to start getting estimates. You’ve likely been planning for this remodel for quite some time and already have your ideabooks with inspiration photos breaking down how you want your space to look. Now’s the time to research materials so you’ll have at least have some working knowledge and be able to have a good conversation with your designer or supplier. For example, marble looks great, but it’s a pain to maintain. Maybe you want to look at easy-to-clean options. Maybe you didn’t know that wood can indeed work in bathrooms or weren’t aware of the great stone possibilities. At this stage, you should be actively reviewing the floor plan, elevations, tile layout and any other relevant drawings associated with your project. More planning means fewer mistakes will come up. Also, you want to be kept up to speed on everything that goes into your project — what materials will be used and how they will be laid out. If something isn’t specified in construction drawings, such as general tile layout or how you want trim pieces in your shower niche to look, chances are your tile installer will make a decision on the spot, especially if you’re not around on the day of installation. This stage will also encompass the permit process. If you’re working with a knowledgeable professional, he or she will take this up, as they are skilled at navigating the process and working with contacts they’ve made at the local planning office. If you’re doing a lot of the work yourself, you’ll need to brush up on what permits you’ll need, and where and how to submit drawings. It’s common knowledge that you should get three separate estimates from licensed contractors for your project. If you’re already working with a designer, he or she may know skilled people or can help you interview different professionals to make sure they’re right for the job. And it helps to know a little about what’s in a contractor’s bid. Don’t let the highest bid scare you, and don’t immediately jump on the lowest bid. Minneapolis resident Nance Lee Mosquera and her husband, Vini, got three bids from contractors for their 8-by-5-foot master bathroom, shown here after their remodel. The first bid came in at $27,000, which elicited an “Are you kidding me?” and “That’s ridiculous” from Nance. The second bid, at $24,000, was equally shocking, mostly because she and her husband offered to do the demolition and painting themselves. The third bid came in at $9,000, and the Mosqueras thought that was more like it. But after they demolished the bathroom, things looked different. The plumbing inside the house was from 1925, and nothing could be done unless it was brought up to code. The pipe went all the way to the basement, so the Mosqueras had to remove a dining room wall and go through three levels of their house to replace it. That added an additional $4,800 just in plumbing costs. There was also electrical wiring that needed to be replaced, which added another $2,000. By this point, they were already at $15,000, not including materials. When the dust had settled, or rather, when the dust had been cleaned up and the bathroom was complete, the total cost came to about $19,000. They saved a little but had to put in a lot more work. Mosquera had to find the materials herself, go to showrooms and purchase everything, and coordinate with installers and other subcontractors to get things done. What she had anticipated would take a couple of months turned into five months. Going with a contractor who offered a higher bid would’ve cost a little more, but would’ve saved them a lot of headache. As mentioned, there’s a lot that goes into a bathroom remodel. Depending on the size and scope of your project, the process can take six weeks to eight months or more, according to the National Kitchen & Bath Association. And while some of it can be done on the fly, you’re much better off the more prepared you are. It’s ideal to have every last detail planned, and every material picked out and ordered, before construction starts. The last thing you want is to get halfway through your remodel and have to tell your construction crew to take a two-week break while you wait for that back-ordered marble to arrive from Italy. You’ll want to nail down the nuts and bolts of how things will flow and where things will generally be placed. You’ll need a dry space to store your materials, so you’ll need to plan on where you’re going to keep everything while construction is underway. Can you make space in your garage or on the side of your house? Are you prepared for the project and disruption? What time will the workers be there, and will someone be on-site to answer questions and oversee the construction? Will it affect your work schedule or any trips? Where will you shower during construction? Who in your family will be available should something come up? Think about how long the crew will be there and if the materials will arrive in time. Any last-minute decisions need to take top priority to ensure a smooth-running project. The National Kitchen & Bath Association recommends that you keep all receipts, contracts, warranties and product information (so you understand how to care for and maintain the materials). Nevertheless, it’s highly likely that your bathroom remodel will have something wrong, overlooked, broken, scratched or missing — a dent in the wall, a malfunctioning drawer, messy caulk. Now’s the time to make a list of these things, either in an informal email or more formal document. Get it into the hands of the person responsible for correcting the mistakes, and include a date by which the work should be completed. It’s probable that your contractor will have to return for several visits to address these concerns. Don’t fret. It’s an inevitable outcome of such a complex undertaking. Try to remember that everyone makes little mistakes and that they’ll get fixed. Congratulations on your new bathroom! Now it’s time to make it look nice with the right towels, mats, soap holders, accessories and more. And if you have kids, don’t forget to childproof your bathroom.